At the juncture between the terms of every US presidency should come books which evaluate an administration’s performance and foreign policy achievements. 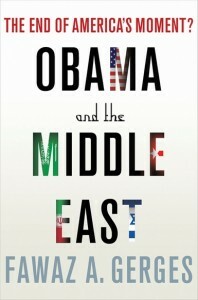 This book does just that, framing the last four years with an introduction which outlines the challenges of poor US economic performance, a bitter post-Bush legacy in the Middle East, the rising political and economic status of the BRICS, and the Arab uprisings in 2011. Like other books currently on the market, such as America’s Challenge in the Greater Middle East and Bending History? Barack Obama’s Foreign Policy; Fawaz Gerges’ Obama and the Middle East: The End of America’s Moment covers the major themes of US contention in the Middle East which the Obama administration is still grappling with. Fawaz Gerges, who is Professor of Middle Eastern Politics and International Relations at the London School of Economics, includes chapters on America’s Legacy, the Bush Doctrine, the Obama “Anti-doctrinal doctrine,” Israeli-Palestinian peace, the pivotal states of Egypt, Iran and Turkey, and the War on Terror; indeed all the major themes of US policy towards the Middle East. The book focuses on the various strands of Middle East domestic politics, taking a historic perspective from the Truman Doctrine in 1947 to the Cold War mode of operation. It identifies that the approaches taken by the US Congress, consecutive administrations (preferring a globalist rather than a much denigrated Arabist approach), and search for safe ground, can all trace their roots back to this period. Ironic then that the Truman Doctrine may have to be reversed (to bring in Russia into a regional solution) in order to solve the Syrian crisis. From the beginning of the book, the US is accused of committing to an Israel-first policy, only to be compounded by poor US relations with other states, notably with Iran after the US hostage crisis in 1979. If not aiming to fundamentally redefine US relations in the region, Obama’s term as President did bring sweeping changes from the failed neo-conservative idealism (i.e. regime change) that defined the Bush era. Obama promised to put diplomacy first by engaging with friend and foe, and adapt to the complexities of the changing international landscape, much to the consternation of the Republican Party which felt his approach was reactive and defeatist. Unlike some other books on Obama’s Mid-east policy, special interest groups and group think are singled out for the poor performance of the Bush administration. Similarly, the book by Samantha Power called A Problem From Hell is said to have informed Obama’s liberal interventionist policy in the Middle East and elsewhere, and led to his commitment to human rights outlined in the National Security Strategy of 2010. However, Gerges draws attention to Obama’s memorandum that same year entitled ‘Political Reform in the Middle East and North Africa’ which hypothesises about whether stability really serves US interests, especially in supporting unpopular regimes. The answer appears to have come before the US administration decided for itself, through protests in Tunisia and Tahrir Square. Reforms were encouraged in the Mashriq and the Maghreb, but not in the Gulf States where counter-terrorism cooperation and energy security considerations appear to be predominate. Of all the chapters, chapter 5, which covers the important and under researched topic of the economic rise of Turkey as one of the ‘pivotal states’ along with Egypt and Iran, is defined as a strategic ally of the US (Obama’s first visit abroad as President was to Turkey). It highlights the likelihood of Turkey developing its own set of contentions and taking a more assertive role on major Middle East issues. The role of the next administration will be to manage US–Turkish relations in a way which stops Turkey from drifting eastwards, while buttressing a sustainable partnership on specific foreign policy issues. Whether this relationship will have an advantageous impact on US policy is yet to be determined, but in the Arab uprisings, any stable and secure partner will be of benefit. Iranian influence in the region is also said to be on the rise, the government having simultaneously managed to crush the reformist Green Revolution, put pressure on the US in Iraq and maintained its resistance credentials against Israel(helped by support for Hezbollah in the 2006 war). Obama’s 2009 ‘open hand’ policy towards Iran over its nuclear programme is evaluated, one which attracted criticism from some neo-conservatives but which remains a preferred policy choice into Obama’s second term. Gerges is also optimistic about the renaissance of Egypt which is undergoing existential changes but remains the bedrock of stability in the Middle East through its 1978 peace treaty withIsrael. The fundamental problem of Obama and the Middle East appears to be his ‘ownership’ of the Arab uprisings, having called them a self determination of individuals and an Arab Spring. Such pre-emptive rhetoric has already backfired in Egypt. The events across the region so far have proved only to be bloody, divisive and do not necessarily correlate with democratic change. Obama’s re-engagement in the Middle East is therefore an attempt to control the democratic transitions of ‘pivotal states’ such as Egypt and Syria, with implications for Iran and the ‘resistance axis’. Gerges also identifies some additional interesting and important trends in US policy on the Middle East, but like many other authors, does not attempt to glimpse into the future possible dynamics or prescribe policy alternatives. The books greatest contribution is the depth of research into the historical roots of the structural constraints and determinants of US policy formulation. The Obama administration should be cognizant of these as it tries to engage with the Arab World. The book will be of interest to historians, students and policymakers involved in advancing US –Middle East relations during this turbulent period dominated by complexity, contention and change. Dr Robert Mason is a Research Associate at LSE and author of the forthcoming “Foreign Policy in Iran and Saudi Arabia: Economics and Diplomacy in the Middle East” to be published by I. B. Tauris.